ChainSim simulation training can be conducted on site or online to your supply chain management team or in to your university curriculum. 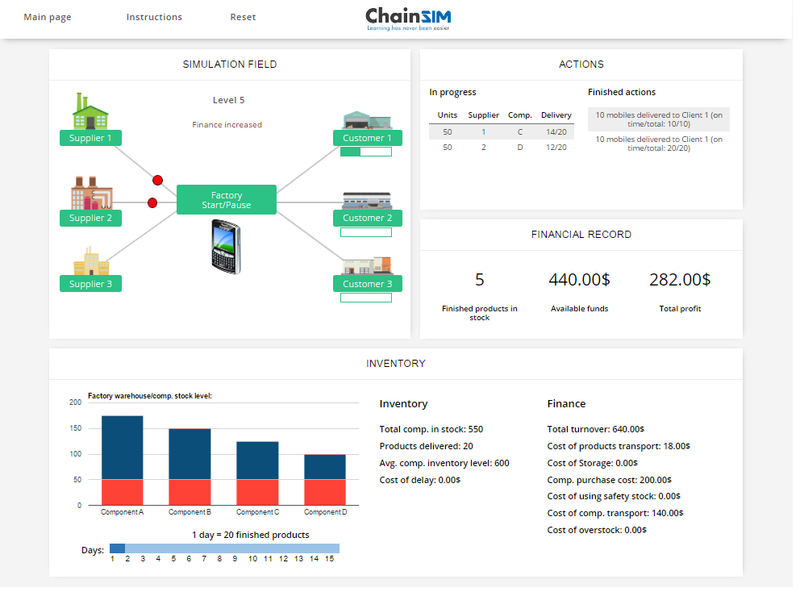 ChainSim simulation helps to understand principles, theories and practices of material requirements planning (MRP) and supply chain management, operations management, and LEAN thinking, critically evaluate and link those to various aspects of performance (financial measures as well as physical inventory aspects). Simulation can be paused, whereas real life cannot. Pausing allows more time for participants to assess what’s going on. Simulation is online application and therefore no need any installation of download. All the computers should have a good connection of internet. Participants and trainer can access to simulation from the page: http://www.chainsim.com/log-in/. There are two password: one for participants (levels) and one for trainers (teacher`s view). Group competency and relationship building – Taking a supply chain team through training together drives consistent learning, cross–functional thinking and collaboration. Customization – In-house training helps attendees understand production and inventory strategies within the unique context of your business. Flexible – There is no limit in number of participant who can log in to the simulation. Therefore there can be also tens of participants who play the simulation simultaneously. Cost – It is far more cost effective to conduct on–site group training than to send teams to public trainings.Simulation is played individually, but can be also played in teams (recommended two-three member teams). During the game it is recommended that each participant/team has a calculator. Speed – Group training allows an organization to train teams quickly, during the hours of the day and time of year that works best. If trainer log in to the trainer’s view, where it is possible to get a clear overview of group member’s results on every level and give feedback/marks according to the results. On the ranking list trainer will see when and who have finished the simulation. By pressing on the button ”Students Results” detailed simulations will emerge. During a training class, the trainer can open the ranking list and organize a competition between the participants or teams, demonstrating who will make the best results. Ranking tables and graphics will stay in the server and the trainer can open the results every time if needed. Participants/teams success is measured by company profits as well as through a dynamic evaluation process in which participants answer probing questions from the trainer and course members.